The Irish Vape Vendors Association is deeply disappointment with ASH Ireland’s media announcement today that smokers should not turn to vaping. Less than 3 hours into the new year, smokers were told that a product that has already seen thousands of Irish smokers switching away from smoking lit tobacco shouldn’t even be considered, in a piece in the Irish Independent which cites ASH Ireland’s Dr Pat Doorley. Smokers switch to vaping for many different reasons, including as a means to cut down or eliminate their smoking completely, and the IVVA is of the opinion that unless the relative risks are communicated accurately and honestly to Irish smokers, policies will continue to wrongly treat vaping the same as smoking. An analysis of the results of the 2014 Eurobarometer survey, published in the journal ‘Addiction’, found that across the EU, 6.1 million people are no longer smoking, having fully switched to vaping, and the Healthy Ireland Survey published in 2016 found that of the 10% of smokers who stopped, 32% of them had used e-cigarettes. ”Evidence and pragmatism should be paramount in formulating policies to reduce the harms from smoking. Smokers should be encouraged to give vaping a try, they shouldn’t be put off by ideological positions that are not in step with current evidence”, said Golden. 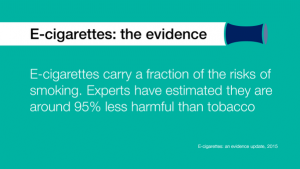 The image at the top of this post is part of an infographic published by Public Health England to accompany their landmark review on vaping products.